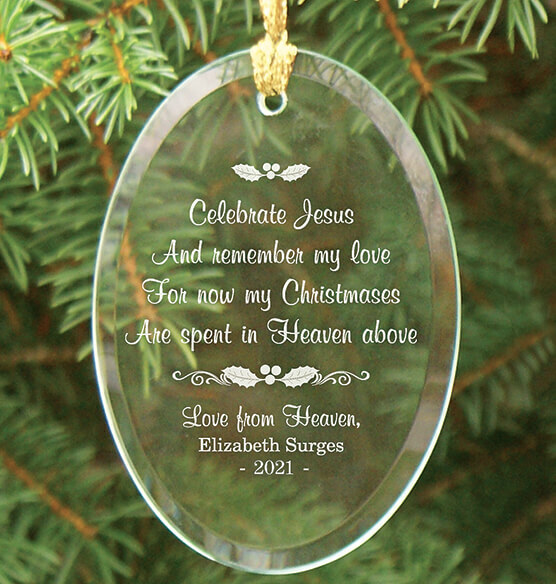 Personalized Christmas In Heaven glass ornament keeps your departed loved one close at heart during the holidays. Our Christmas In Heaven ornament is personalized in loving memory with a beautiful engraving that offers these words of comfort: “Celebrate Jesus and remember my love, For now my Christmases are spent in Heaven above.” We’ll personalize this heartfelt keepsake, comforting grieving hearts at Christmas. Specify name; limit 1 line, 30 letters/spaces. Specify year; limit 1 line, 4 characters. 2 1/2" long x 3 3/4" wide. Allow 2-3 weeks for delivery. No express shipping. Gifted to a relative who was delighted to receive it. Beautiful token remembrance which will be cherished always. You have to hold it a certain way to be able to read it. But it is really beautiful & of course the words are very touching. Gifted to a relative who was delighted to receive it. Wonderful token rememberance which will be cherished always. I am giving this product to my Grandmother and my Mother in memory of my Grandfather. I think it has a very nice message and the engraving is really beautiful. However, it is really thin glass, and I feel like it could snap in two just by holding it. Also, the etching isn't protected so I kind of feel like it could rub off. But overall, I love it! Thank you!